Alicia and and Lucca head to Toronto to help Jeff Dillinger who was returning to the US for his mother’s funeral after hiding out in Iceland because he released classified information. The question is whether the US Customs officials have the right to hold him because he had entered their pre-clearance area at the Toronto airport. The justice of the peace rules that the US can’t hold him but then they issue a warrant for his arrest on espionage charges and asks for him to extradited. The US introduces an audio recording of Dillinger on the phone to another NSA agent whom they call to the stand. It eventually comes out that they were using Alicia’s phone as a hot mic and that’s how they got their information. When they lose the extradition hearing, Alicia asks that Dillinger be given asylum in Canada as espionage charges can carry the death penalty. Lucca and Alicia stage a call saying that the NSA doesn’t want the CSE (Canada’s version of the NSA) to have Dillinger because of what he can share about their operation. With the CSE listening in, Dillinger gets his asylum. Kurt tells Diane he wants to sell his business and move in with her so that they can spend more time together. She’s thrilled until she finds out that she’s selling his company to a rival for only 60% of what it’s worth. Diane finds out that the buyer is Kurt’s gorgeous former student and she tells her she has to pay 30% more or the deal is over. Later, Diane apologizes and says that Kurt should sell to whomever he wants. He says he’s going to find another buyer because he loves Diane. 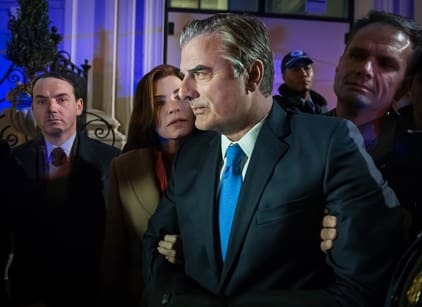 Peter will be arrested and Eli and his attorney negotiate the terms of him turning himself in but the AUSA reneges on the deal and surprises Peter with an arrest warrant, making sure the press is there for the event. Alicia is by his side the entire time. Peter’s attorney asks Jason to investigate what the AUSA has on Peter. Jason goes to Cary to ask about the mistrial and what’s not in the file. The bullets went missing in the middle of the trial. Cary thinks the crime lab was sloppy. The AUSA offers Peter a deal of three years in prison. Peter tells Alicia that it feels as though they’re right back where they started. Alicia tells Jason that she and Peter are divorcing. He asks her what she really wants. Alicia says she wants him.